It’s part one of a two-part story airing on Tuesday’s All Things Considered and Wednesday’s Morning Edition. 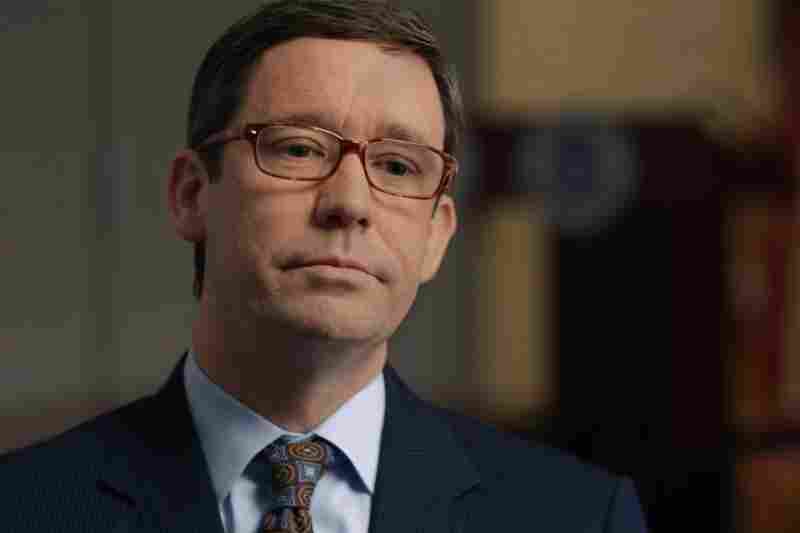 Watch the full investigation, “Business of Disaster,” Tuesday night at 10 p.m. / 9 p.m. Central on your local PBS station, or watch online. 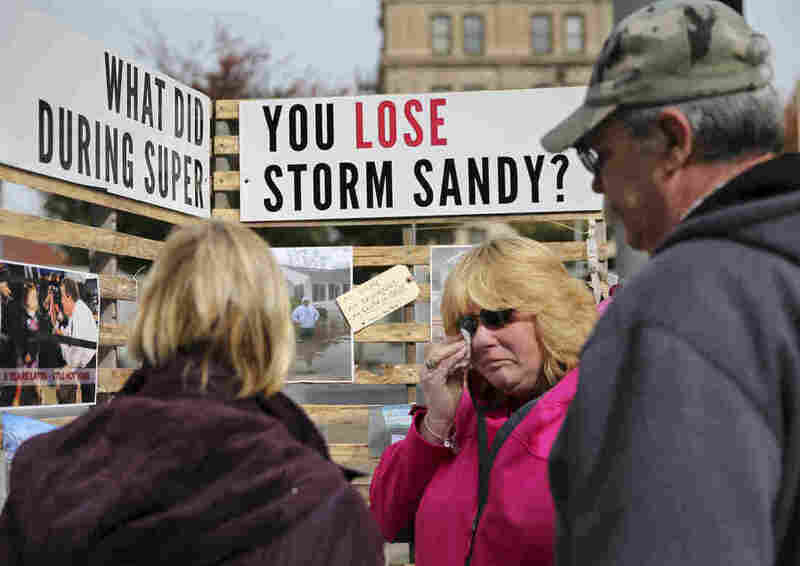 Everyone had come to make the same point: They’d made it through Superstorm Sandy, which hit the shores of New Jersey and New York in October, 2012. But three years later, many hadn’t made it home. The night of the storm, a wall of water surged across his lot, swamping Quinn’s foundation and most of his first floor. State officials said his house had to come down, so he had it razed. But when the letter arrived from the insurance company, he didn’t get $250,000. He got $90,000. That wasn’t enough to rebuild his home. Now, more than three years later, he is still paying the mortgage on this nonexistent home while he rents the house he lives in now. If it was a game, he wasn’t the only player. 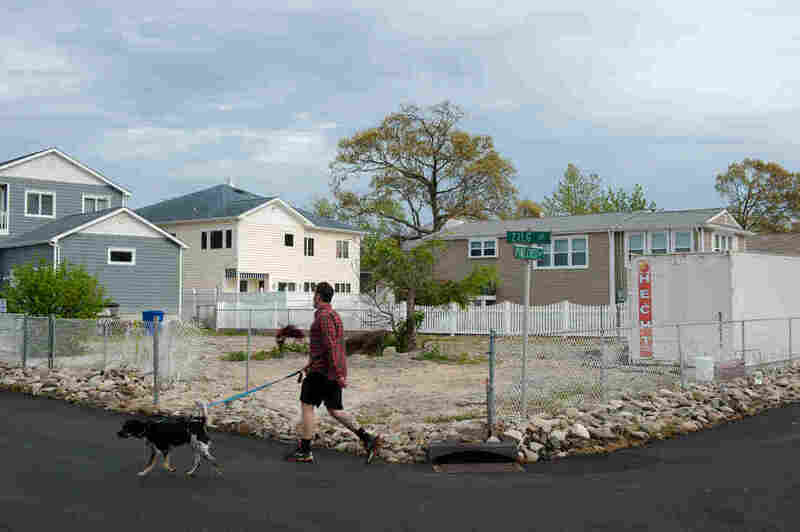 Thousands of homeowners across New York and New Jersey were underpaid. Some got just a fraction of their policies. FEMA runs the government flood program. But it doesn’t write the policies or manage the claims. It pays private insurance companies fees to do that work. When homeowners buy flood insurance, they pay a fee that doesn’t actually stay with the insurance company. It goes into a pot of money to the flood program. After a disaster, the insurance companies that participate in the flood program decide how much a homeowner will receive. They then pay homeowners using the pot from the program. In theory, homeowners shouldn’t be shortchanged because the insurance companies are only acting as a middleman between FEMA and the homeowners making claims, essentially contracting with the government to evaluate damage and assess compensation. David Charles, an insurance adjuster that represents homeowners, says he had always loved his job and never had any problems with insurance companies. But after Hurricane Katrina destroyed much of the Louisiana and Mississippi coasts in 2005 — and became the most costly storm in U.S. history — things changed. Dozens of homeowners we interviewed described something different. So did several others who worked closely with the insurance companies after the storm. 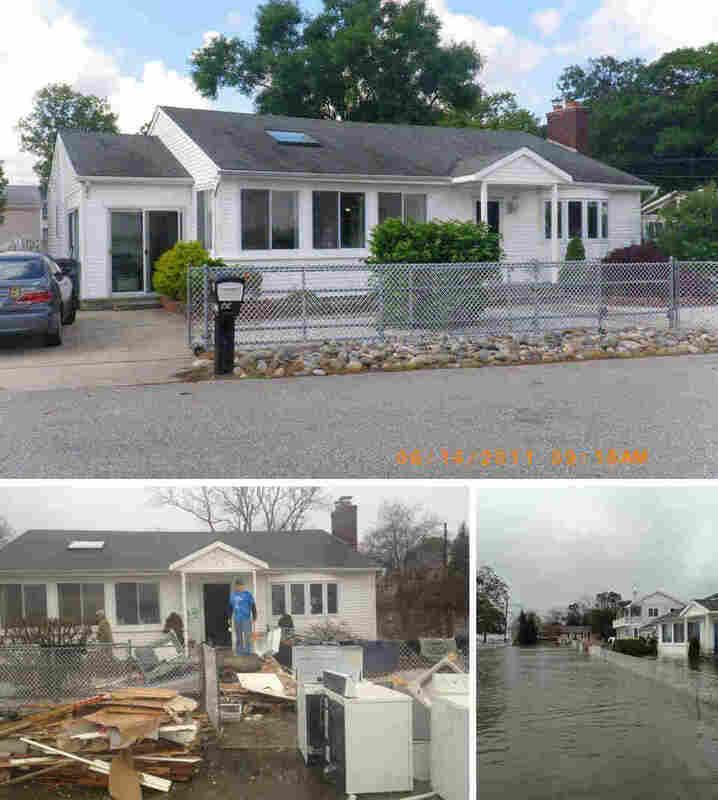 Jeff Coolidge reviewed adjusters’ files for multiple insurance companies after Superstorm Sandy. He says he quit his job in part because he was so bothered by what he was doing. The insurance firms he worked for used phrases like “pre-existing,” “earth movement” or “ground settlement” to reject homeowners’ claims of flood damage. “They use ‘settlement’ a lot. ‘Sorry your house looks like it shifted to the left a little bit, but I think it was like that when you bought it,’ ” Coolidge said. If the adjuster wanted to pay the homeowner more, Coolidge would reject the adjuster’s assessment until he got the answer his employer wanted, and in some cases he switched adjusters or threatened to do so. 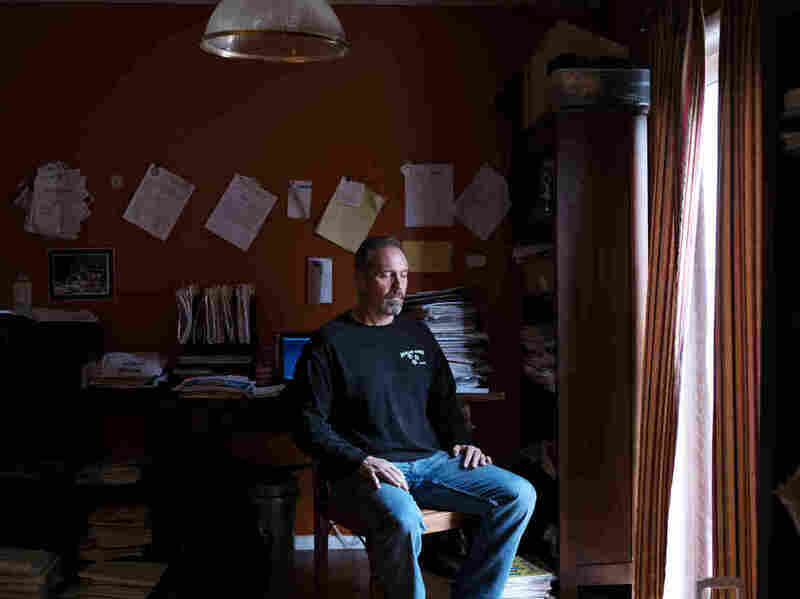 “‘I’m going to take half your pay and give it to him,” he recalls telling several adjusters. Hunter says that’s partly because the program doesn’t charge homeowners enough in premiums to adequately fund itself. But, he says, it’s also because FEMA pays the private insurance companies too much money. At least a third of the money that homeowners put into the program gets paid to them, he says. Last year, government data shows, that came to more than $1 billion in fees. Hunter says with so much money going to insurance companies, it’s that much harder to cover storm losses, or save up to help pay for the really big ones, like Katrina or Sandy. For one, industry experts say insurance is a commercial business. It looks to lower costs and keep payments to homeowners in check. It’s just habit, they say — even if it’s not their money. But there was one more theory. The insurance companies make money on the program, regardless of how big the storm or the cost to taxpayers. But they won’t make any money on the program if it doesn’t exist. So, the theory goes, the companies sought to cut the program’s debt to save the program — and they did that by paying homeowners less. Mostyn has scoured insurance company documents for almost two years. He points to the repeated hearings Congress has held on Capitol Hill over the past few years asking why this program is so far in debt, and talking about privatizing the flood program or even ending it. But Wright, who took over the flood program for FEMA last year, says he doesn’t know how much money the insurance companies make from the program. The nation’s largest insurance firms declined to disclose their profit margins on the flood program. 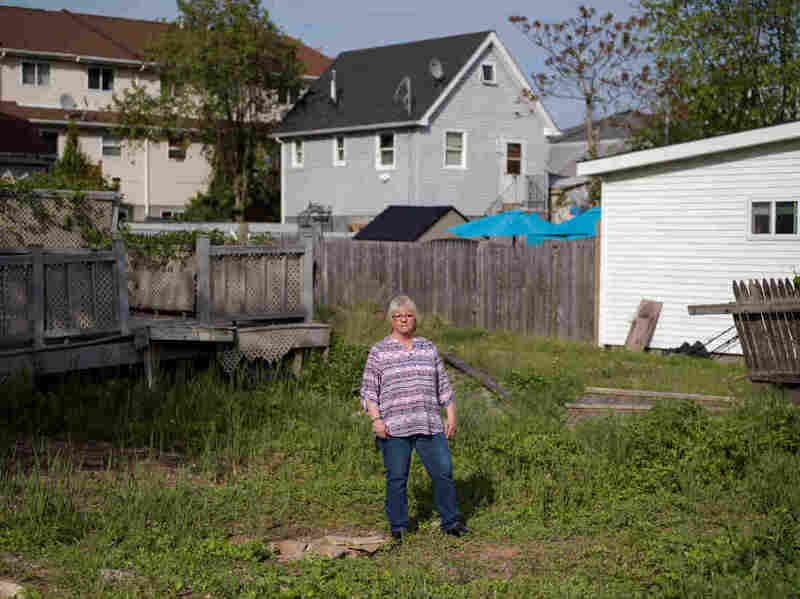 Far from Superstorm Sandy’s epicenter, in Houston, attorney Mostyn found a curious similarity among many of the homeowners he now represents in his lawsuit against the insurers. He said he found a pattern among engineering reports that were used to reject or justify lower payments on homeowners’ insurance claims. 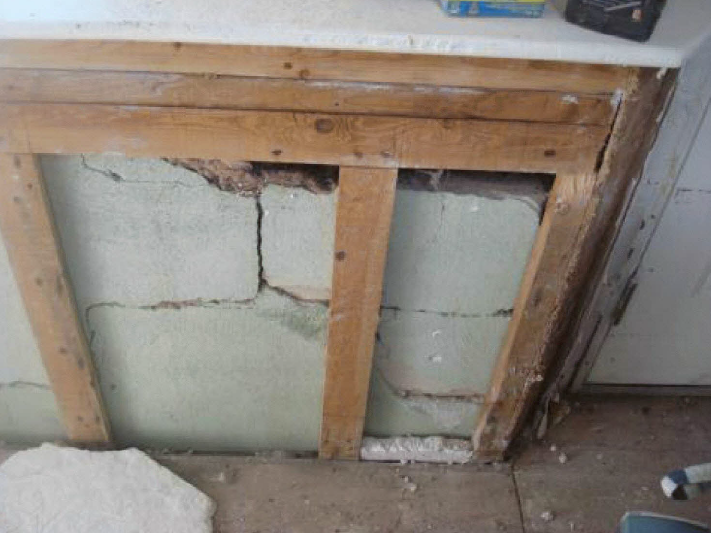 There seemed to be a template that many of the reports followed, which says the houses hit by the storm were not structurally damaged by the flood but were damaged by “long-term differential earth movement.” That means natural forces over a long period of time damaged the home — not whatever disaster just occurred. 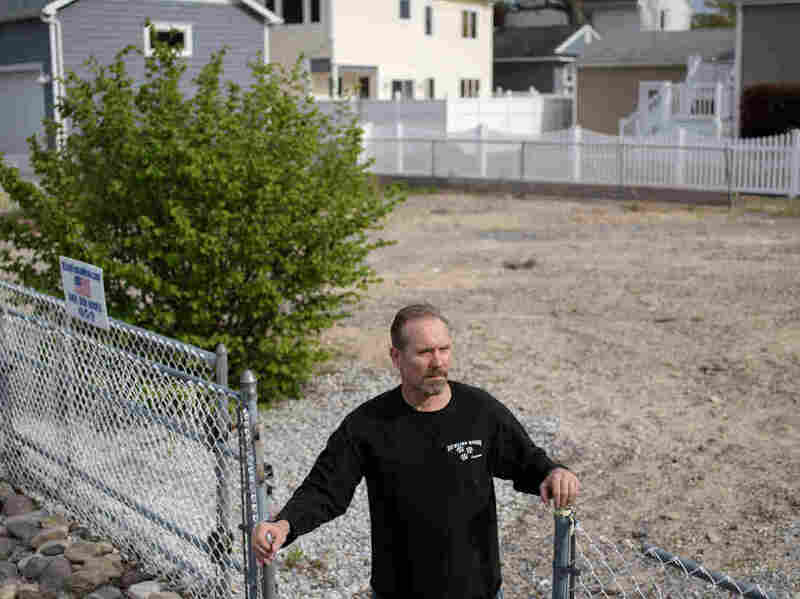 That’s what homeowner Quinn was given for the reason his insurance company, Selective, used to deny much of his claim on his home along the New Jersey coast. But Quinn was confounded. He had photos of his foundation from a year earlier. He didn’t have any cracks. The day after the storm, large cracks were all over his foundation. Quinn says he wasn’t thinking about whether other people were in his same situation or whether the insurance companies were trying to keep the program costs down. He just thought it was a mistake. So he did what a lot of people did: He appealed to FEMA. Selective declined to comment on Quinn’s case. But NPR and Frontline obtained a copy of Quinn’s case file. In it were emails between FEMA and Selective that Quinn had never seen before. We showed the filed to Quinn, and he started to read. As he got to the end, he saw where it says FEMA sent Selective his appeal and then asked Selective to review it and write a response. According to FEMA’s own internal documents, FEMA sided with insurance companies almost 75 percent of the time. 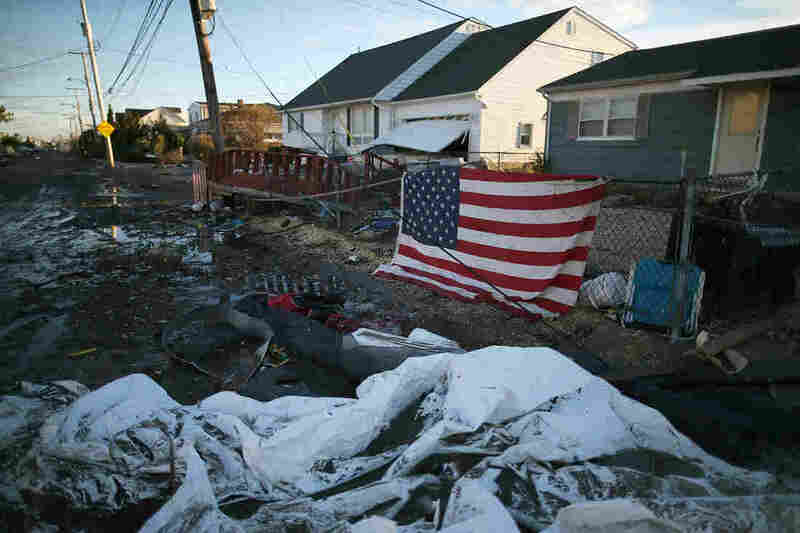 A government audit recently found that the process received inadequate oversight from FEMA. Wright acknowledges FEMA sent appeals to insurance companies. Wright says he is making changes to the appeals process to ensure that it’s more transparent and that homeowners get a fair review. “The appeals process that was in place in the past did not have enough credibility,” he says, adding the appeals have now been moved into a different department separate from claims review. Last year a Senate committee couldn’t find any widespread underpayments of claims. As for Quinn, he sued and eventually settled with Selective. In addition to the $90,000 in claim money that he received, his settlement gave him an additional $130,000. Quinn paid one-third of his settlement in legal fees. Win or lose, FEMA pays all the insurers’ attorney fees. Until he can rebuild, he’ll keep paying a mortgage and flood insurance on a house that no longer exists. Health officials have warned for years that the world is not ready for the next big pandemic. Leaders at the World Health Organization are meeting this week to try to change that. The NFL announced three new sites for upcoming Super Bowls on Tuesday. Atlanta will get Super Bowl LIII in 2019, South Florida will host the following year and Los Angeles will have 2021. The league had previously announced that the championship game would be held in Houston next year and in Minneapolis in 2018. “The vote capped a year-long effort by the Falcons and Atlanta’s bid committee to secure the game for the $1.4 billion retractable-roof stadium under construction next to the Georgia Dome. Earlier this year, the NFL had warned that the city could jeopardize its bid over Georgia legislation that restricted rights of LGBT people. Under pressure from the league and Atlanta businesses, the governor vetoed the bill in March, as The Two-Way reported. The last time Los Angeles hosted the Super Bowl was 1993, The Los Angeles Times reports; the city’s new stadium is expected to open in 2019. The Florida Sun-Sentinel notes that the bidding process has become more competitive in recent years “due to the economic windfall that it brings. 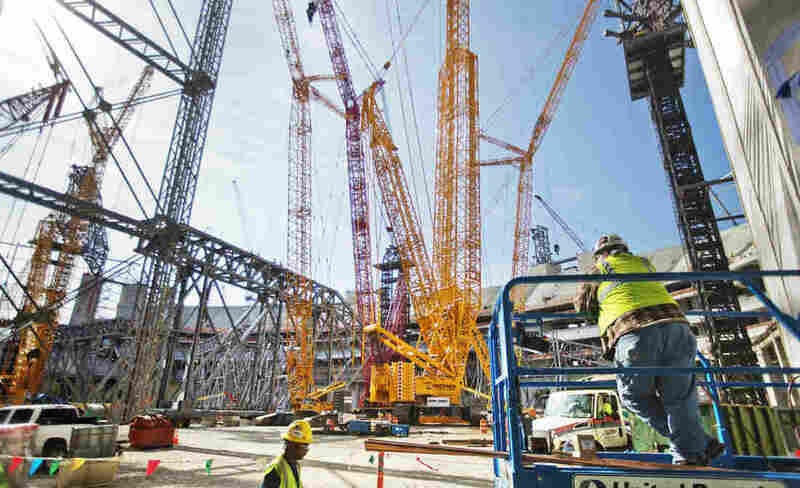 The league has been favoring cities with new or significantly renovated stadiums. The stadium in South Florida is undergoing a $450 million renovation by Dolphins owner Stephen Ross. 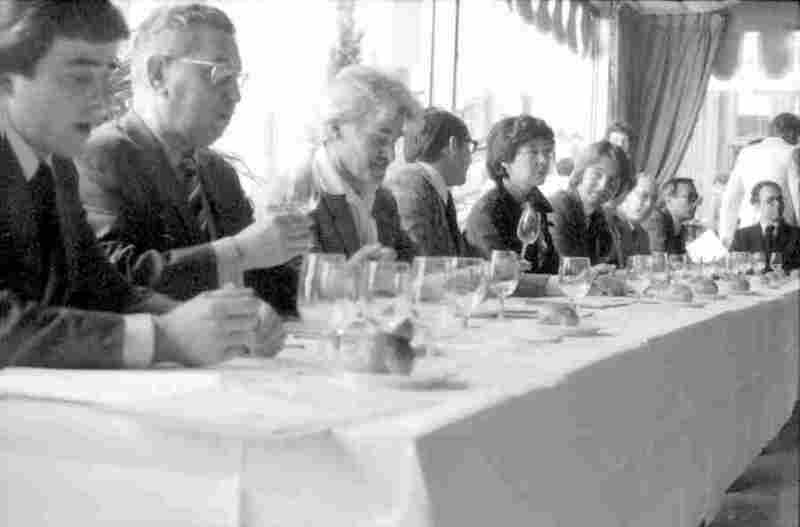 Forty years ago today, the crème de la crème of the French wine establishment sat in judgment for a blind tasting that pitted some of the finest wines in France against unknown California bottles. 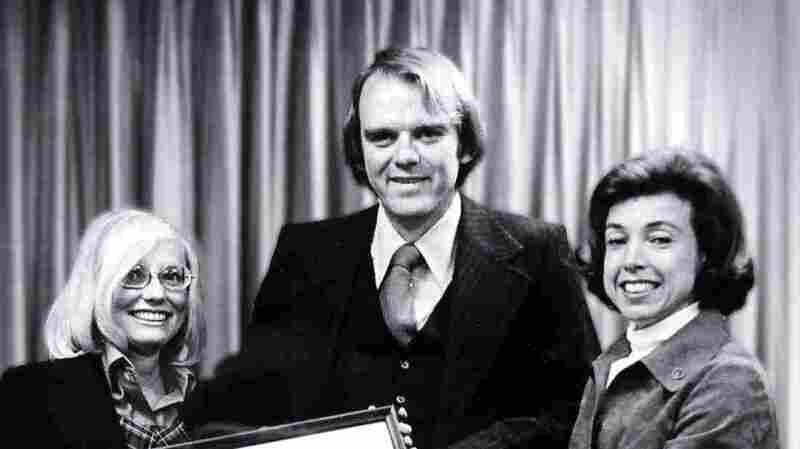 Only one journalist bothered to show up – the outcome was considered a foregone conclusion. Taber did show up — as a favor to the organizers. And he ended up getting the biggest story of his career: To everyone’s amazement, the California wines – reds and whites — beat out their French competitors. 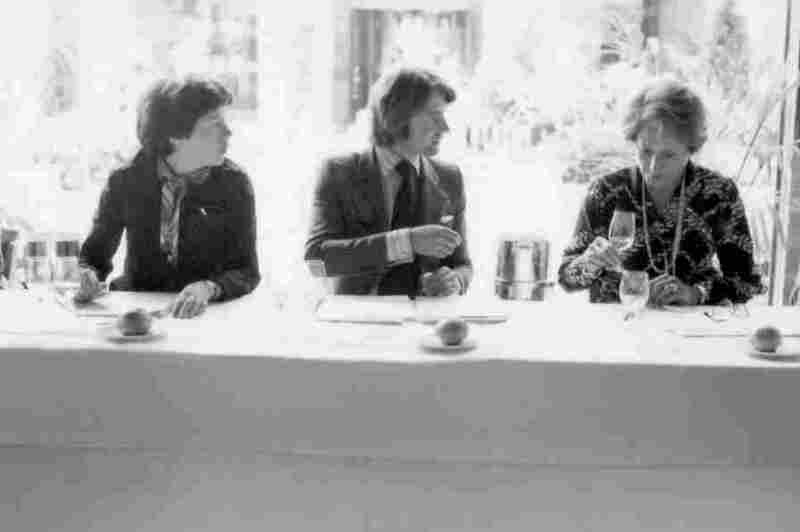 At one point, Taber says, a judge – Raymond Oliver, chef and owner of Le Grand Véfour, one of Paris’ great restaurants — sampled a white. “And then he smelled it, then he tasted it and he held it up again, [and] he said, “Ah, back to France!” Taber recalls. Wine writer David White says the tasting was a major turning point for the wine industry. “The 1976 judgment totally changed the game,” says White, who writes the popular wine blog Terroirist and is the author of the forthcoming book, But First, Champagne: A Modern Guide to the World’s Favorite Wine. 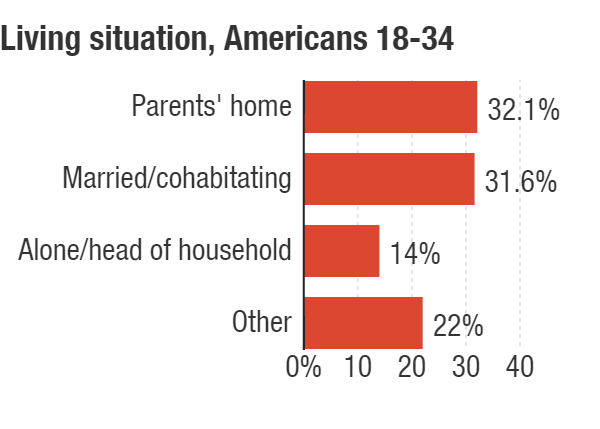 For the first time in more than 130 years, Americans age 18-34 are more likely to live with their parents than in any other living situation, according to a new analysis by the Pew Research Center. In that age group, 32.1 percent of people live in their parents’ house, while 31.6 live with a spouse or partner in their own homes and 14 percent live alone, as single parents or in a home with roommates or renters. The rest live with another family member, a non-family member or in group-living situations such as a college dorm or prison. 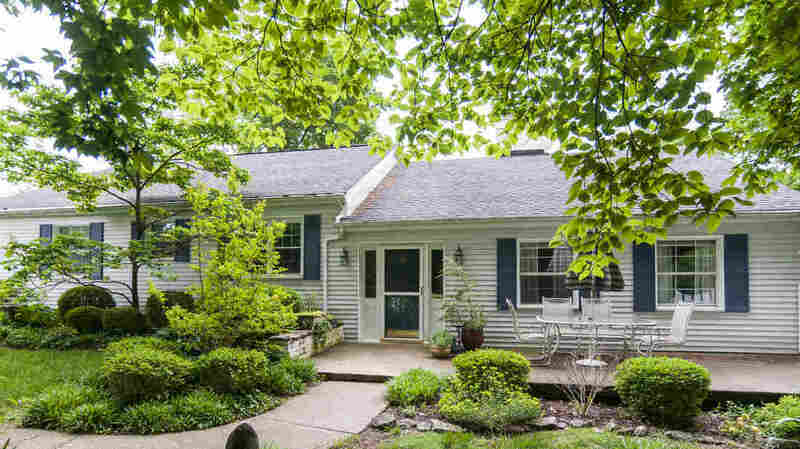 Pew notes that this is not a record high percentage for the number of young people living at home — in 1940, for instance, approximately 35 percent of people in that age range lived at home. But back then, living with a spouse or partner was even more popular than that. Today not so: More people choose an alternate living situation, and out of the crowded field of choices, life with mom and/or dad has become the top pick for millennials. Well — some millennials. Men, for starters. American men age 18-34 live with their parents 35 percent of the time, and with a spouse or partner 28 percent of the time. For women, the numbers are nearly reversed; 35 percent live with a partner, while 29 percent live with their parents. Less-educated young adults are also more likely to live with their parents than their college-educated counterparts — no surprise, Pew notes, given the financial prospects in today’s economy. Black and Hispanic young people, compared with white people, are in the same situation. For black people in particular, the “new” milestone isn’t so new at all. Black young adults have been more likely to live with their parents than in any other situation since 1980. Today, 36 percent of black millennials live with their parents, while 17 percent live with a a spouse or partner. Meanwhile, taken as a whole, women, white people, Asian/Pacific Islanders and people with bachelor’s degrees are still more likely to live with spouses or partners than with their parents. But the overall trend is the same for every demographic group — living with parents is increasingly common. For many millennials, Pew’s conclusions might seem both unsurprising and easy to explain: The Great Recession happened, of course! But the rise in the number of young adults living at home started before the economic crash — and so did the possible contributing factors. Male unemployment has been on the rise for decades, Pew says. Even those who have jobs are making less than they would have in their parents’ day — for young men, Pew notes, inflation-adjusted wages have been falling since 1970. And then fewer young people are married than in decades past. Even accounting for the increased popularity of cohabitation, there are just fewer paired-up 20-somethings and 30-somethings than there used to be. In general, the study shows how dramatically the living situations of 18- to 34-year-olds have changed since 1880, when the data begins. Living alone, as a single parent or with roommates — once a rarity — is now the choice of 14 percent of people in that age group. And a full 25 percent of young men are now living with other family, non-family or group quarters. Male prosperity rose steadily, and more and more men left the nest — until the ’60s and ’70s, when wages started to drop and more men stayed home. And women? For decades women who worked were more likely to live with their parents than with a partner or spouse — because wives were discouraged from having jobs, per Pew’s straightforward interpretation. But now more and more young women have jobs, and it’s unemployed women who are more likely to live with their parents. And yet, even as female prosperity rose, so did the number of young women living at home. Pew speculated it might because of men’s lower earnings keeping women from marrying and moving out. Seem plausible? The question might make for a fruitful conversation in households across America tonight … just ask Mom to pass the peas and the theories. NPR’s Audie Cornish speaks with Dan Vyleta about his novel, Smoke. It’s set in an alternate 19th century London, where the morally corrupt are marked by a smoke that pours from their bodies. The mountain hamlet of Woodstock in upstate New York was well known as an artists’ colony even before the mid-’60s influx of musicians. In fact, it was known well enough among the musicians who lived there, particularly Bob Dylan, that it lent its name to the famous festival that actually took place many miles away. Journalist Barney Hoskyns, a one-time Woodstock resident, has written a book about the town called Small Town Talk. Hoskyns says that Dylan’s longtime manager Albert Grossman was the catalyst for bringing so many musicians to Woodstock. Dylan himself fell in love with the area while staying at Grossman’s estate and quickly found his own niche; his desk and typewriter in the white room above Cafe Espresso saw the birth of many classics. 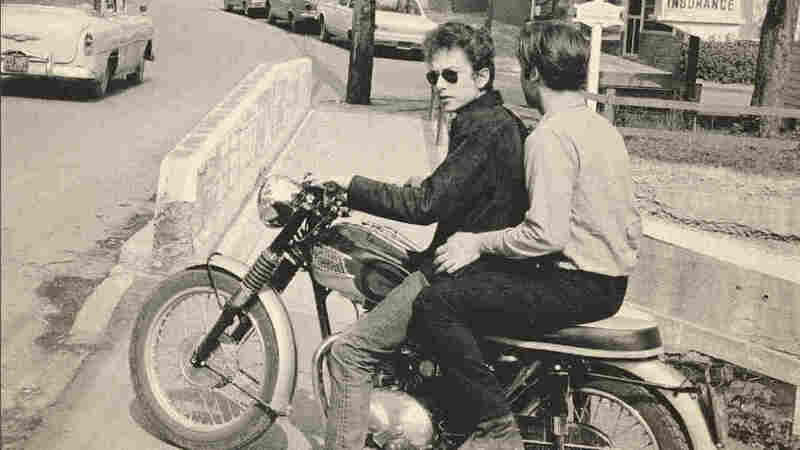 On Dylan’s 75th birthday, hear Hoskyns discuss the special relationship Dylan and his band had with Woodstock. This election year may well go down as the conspiracy-theory election, thanks to Donald Trump’s ceaseless efforts to inject unsubstantiated plots into the American political debate. On Monday, Trump, the de facto Republican nominee, unloaded a double-whammy on his likely Democratic opponent, Hillary Clinton. An ad posted to Instagram by Trump’s campaign alleges that Clinton’s husband, former President Bill Clinton, sexually assaulted several women. 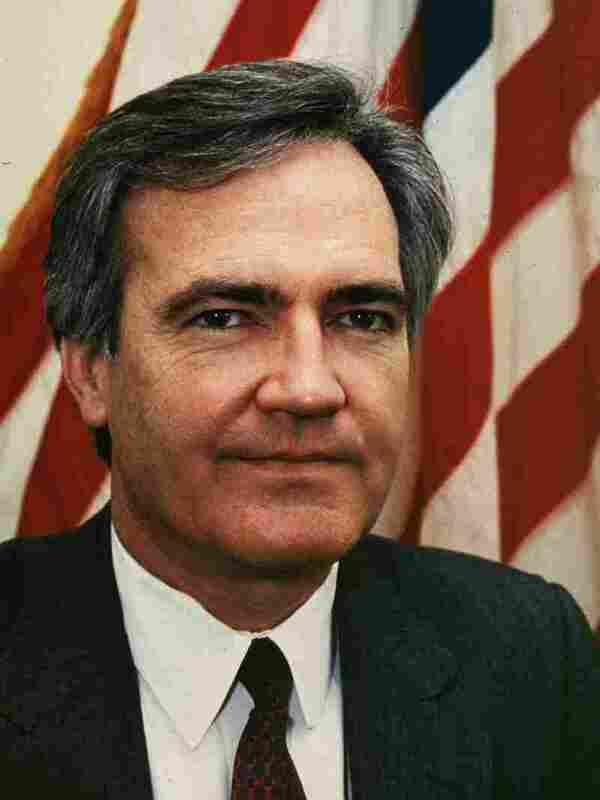 In an interview with the Washington Post, Trump also alleged without evidence that Hillary Clinton was involved in the death of Vince Foster, a White House aide who committed suicide in 1993, the first year of Bill Clinton’s presidency. The facts rarely line up on Trump’s side in these instances, but Trump has a history of making outlandish claims that get lots of attention. As Yale professor Jason Stanley told NPR’s Sarah McCammon earlier this year, Trump’s embrace of innuendo and controversial statements sends a direct message to his followers. “He’s communicating, ‘I’m not held to the norms that anyone else is,’ ” Stanley said. Because it’s going to be a long five-and-a-half months until Election Day (but hey, who’s counting? ), here, in chronological order, is a far-from-comprehensive list of conspiracy theories that Trump has embraced. The patient zero of Trump conspiracy theories is his 2011 claim that President Obama was not born in the United States and, therefore, not eligible to be chief executive. 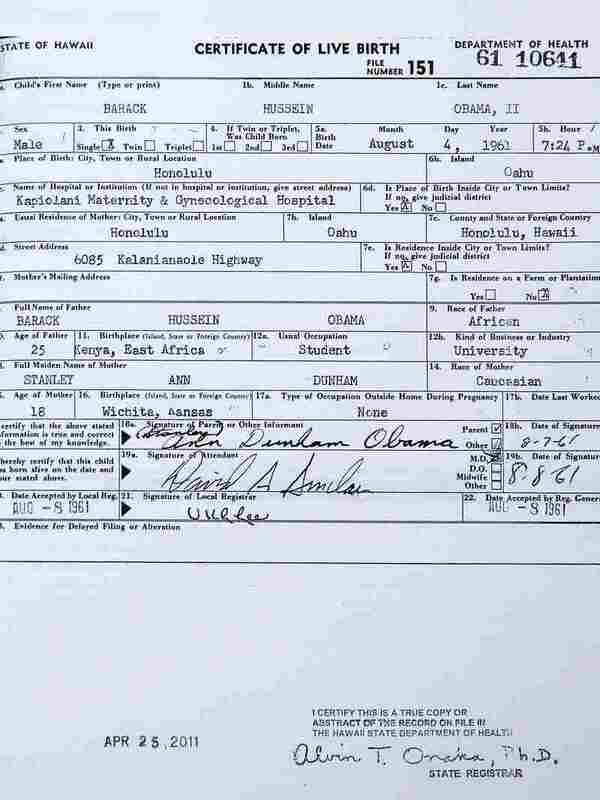 Backers of that theory came to be known as “birthers” and, to be clear, Trump didn’t start the rumors about Obama’s place of birth. But he used his fame as a reality TV personality to insert the issue into the mainstream media conversation. Trump has repeatedly embraced the discredited theory that childhood vaccinations can lead to autism. In the second GOP presidential primary debate, hosted by CNN in September 2015, Trump didn’t back down on the claim even when confronted with evidence that vaccines are safe. A 2013 study by the Center for Disease Control found no connection between childhood vaccines and a risk of autism. Campaigning in Alabama last November, Trump claimed that Muslims in New Jersey celebrated the attacks on the World Trade Center on Sept. 11, 2001. Trump repeated the claim multiple times over the following days, repeating an internet rumor that has circulated since the attacks despite comprehensive reporting from that time that debunked the claims. What’s clear to us — and should be to Trump — is that there were no widespread televised celebrations in New Jersey on 9/11. In fact, what Trump described would have been big news, and the reporters at the Daily News, Star-Ledger and elsewhere who tried and failed to track down rumors of 9/11 celebrations could have just turned on the TV to get their story. Just days after the death of Supreme Court Justice Antonin Scalia at a ranch in Texas this past February, Trump weighed in on claims that Scalia had been murdered. In an interview with radio host Michael Savage, Trump said “they say they found a pillow on his face, which is a pretty unusual place to find a pillow,” before saying he was unable to respond further. According to the Associated Press, the Presidio County District Attorney cited a letter from Scalia’s doctor that said the 79-year-old justice suffered from a variety of ailments that likely contributed to his death and there was nothing suspicious about his body when it was discovered on Feb. 13, 2016. Trump also suggested without evidence, that President Obama did not attend Scalia’s funeral because Scalia was Catholic and that Obama might be a secret Muslim. On the cusp of wrapping up the Republican nomination contest earlier this month, Trump went to the well of one of the most enduring conspiracy theories in American life: the assassination of President John F. Kennedy, Jr. in 1963. The supermarket tabloid’s claim rests on a grainy, 53-year-old photo that purports to show Cruz alongside Oswald. Facial recognition experts consulted by PolitiFact said there was no evidence Cruz was in the photo and that it was highly unlikely a young Rafael Cruz would have run in Oswald’s circles. The fact checking group rated Trump’s claim “Pants on Fire” false. Trump’s latest attack ad claims President Bill Clinton sexually assaulted several women while president during the 1990s. It uses archival tape of former White House intern Monica Lewinsky, Kathleen Wiley, a former White House volunteer who says Clinton groped her in 1993 and Juanita Broaddrick, who says Clinton raped her in 1978. Clinton did have a sexual relationship with Lewinsky that resulted in an unsuccessful impeachment trial in the U.S. Congress. Lewinsky has never claimed Clinton assaulted her. Clinton denied the Willey’s and Broaddrick’s allegations. As reported by the Washington Post, an independent prosecutor investigating Clinton at the time found there was “insufficient evidence” to charge Clinton with lying about Willey. Clinton also denied the allegations about Broaddrick and no charges were ever filed against him. The Post also concludes that Trump’s attacks against Clinton on these allegations are hypocritical given that Trump quoted on the record at the time as being extremely dismissive of the various claims against Clinton (for future reference, the Post’s Glenn Kessler has also done yeoman’s work putting together a short guide to all of the sexual allegations leveled against Bill Clinton). This week, Trump also embraced the ur-Clinton conspiracy theory: the 1993 death of White House aide Vince Foster. Foster was an Arkansas ally of the Clinton’s who served as deputy White House counsel at the start of the first Clinton term. He was found dead in his car in Virginia in July 1993. 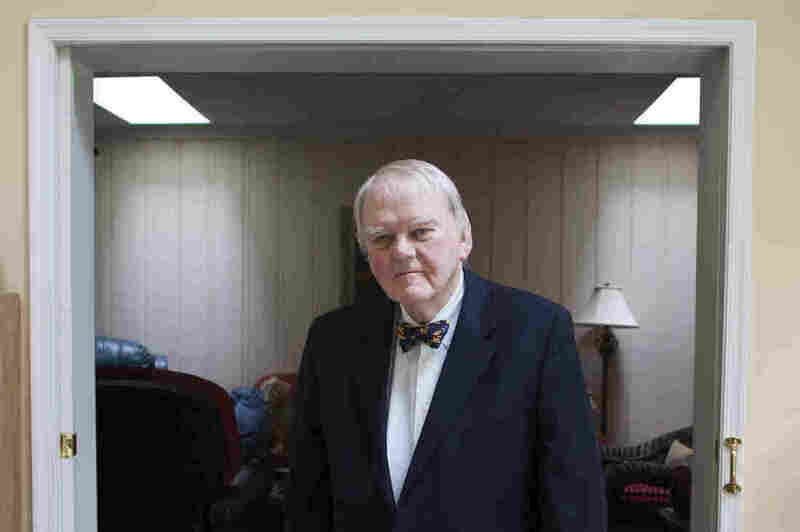 Foster’s death sparked years of conspiracy-theorizing from Clinton’s opponents about whether the facts behind his death were covered up to hide financial misbehavior in the . Foster’s death was cited in investigations into the Clinton’s real estate investments with the Whitewater Development Corporation (yes, that Whitewater). 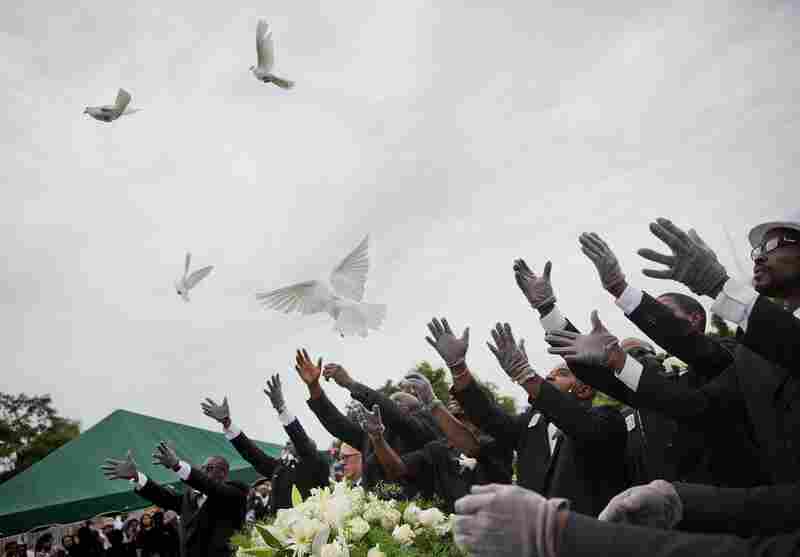 Multiple investigations by various federal agencies and independent counsels throughout the rest of the 1990s concluded that Foster’s death was a suicide and that was he was clinically depressed when he died. 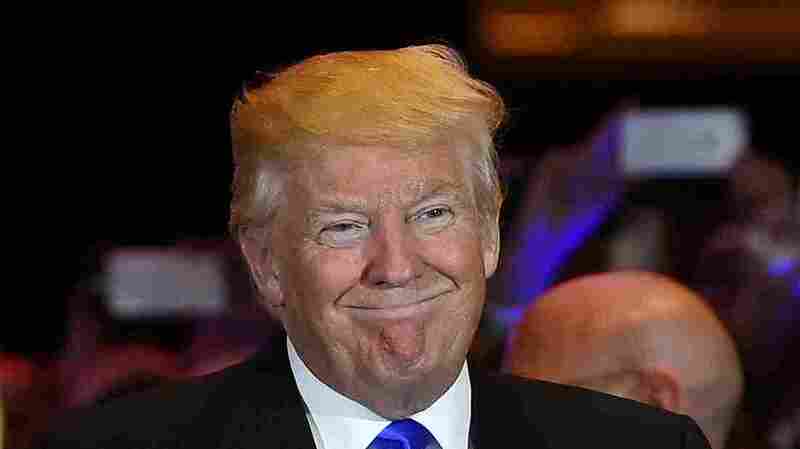 Bonus: Is Trump’s candidacy a Democratic conspiracy? Perhaps the best Trump conspiracy theory is the one he doesn’t embrace: that Trump’s candidacy is the product of a conspiracy. After all, Trump was once a registered Democrat, and backed policies such as increased taxes on the wealthy, gun control and single-payer health care. He praised Bill and Hillary Clinton for many years, donated money to them and invited them to his third wedding. As Trump himself might say, I don’t know if it’s true but it seems fishy.